Sean McCulloch and Ken Gutermuth among the hopefuls in the opening round of a heat. Peter Staab drops those fickle dice against Ken gutermuth as daughter Lisa watches. Jeremy Billones and Jim Bell battling for their first championship in the Final. March Madness has always held a special place in my heart. Part of the reason is that it debuted as a tournament during 1992, my first time attending the old Avaloncon, starting a streak of 15 years for it, and for me. Moreover, I maintain that it is in many ways the ultimate WBC experience: Keep winning, and make the Final Four; lose, and you're out ­ but you can try your luck in multiple heats. In the end, however, what keeps me running this event, and keeps others coming back, is the high level of competition for a supposedly simple sports game ­ something that is matched only by the level of sportsmanship and camaraderie. Many veteran gamers, masters of their genres, have tried to succeed at March Madness, only to find that the game has more subtleties than they realized. Some, like 2005 winner Marvin Birnbaum, finally break through after years of trying. Others mumble about it being a 'dice game' and wander off, somewhat dazed by the experience, to the more comfortable surroundings of hexgrids or 'Euro' tiles. Most, however, of the 32 coaches in this year's event turned out to be true enthusiasts. More than 80% of the field played in multiple heats. Our total attendance was down from the last two years, which can be largely attributed to the debut of new WBC events. In particular, the very popular Twilight Struggle seemed to draw away from Friday's heat, which in previous years was the most highly attended of the four. In recent years, the March Madness format has been modified, where we moved away from pre-generated brackets for each of the four heats. Traditional Pacific Rim powers such as UCLA were still placed in the West regional, UMass in the East, and so forth. Anyone who pulled an upset was still rewarded by their section of the draw opening up. This system has proved popular, mainly because it gets everyone playing immediately, with very few byes needed. Tuesday evening's West Regional featured a number of West Coast teams, but only a couple of them fared well. Former champ Dennis Nicholson employed his favorite hurry-up offense with UCLA 70 to prevail over Sean McCulloch 102-91. Another wild melee ended with Carrie Lewis and her New Mexico State 70 team outscoring Roger Taylor 99-87. And while it wasn't a traditionally western team, Mark Yoshikowa beat Bruce Monnin, fresh off his PBeM chmpionship, in a similarly high-scoring game, 95-90 on the last die roll. The other side of the draw featured lower-scoring games, as Debbie Bell defeated former Consul Devin Flawd 61-55. Your friendly GM continued a trend on opening night by losing the first round to Doug Galullo, 72-68, who then lost to Carrie Lewis. Meanwhile, Jeremy Billones was quietly moving through the draw, defeating Paul Risner, Mark Yoshikowa, and Jeff Finkeldey to reach the regional final. 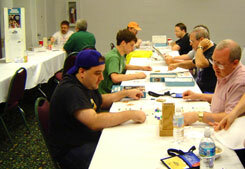 His opponent was veteran sports gamer Harry Flawd, who had beaten Mark Giddings, survived Dennis' highscoring onslaught, and then triumphed over Carrie, to place his Louisville 75 team in the regional final. In the end, Harry's balanced team was unable to score enough, and Jeremy made his first Final Four. The second heat had a healthy 19 players, including a dozen who had not played the previous heat. Harry Flawd, undeterred by his loss, was back for more, but lost to an inspired Andy Lewis. Andy and his Georgetown 86 team became the story of the tournament, with one triumph over another Flawd (Devin) and Chris Bauch, on his seemingly inevitable march to the final with the lowest seed. Meanwhile, Pete Staab beat past champ John Coussis. Roger Taylor ran into another red-hot player in Derek Landel, and Terry Coleman squeaked by Mark Yoshikowa in overtime - the third consecutive nail biter that these friends have played. Terry then steered his Providence 73 team to a victory over Pete, to meet Andy in the regional final. It looked like Terry would run away with it, as he built to an early 21-point lead. But Andy never gave up, and fell just short in a furious comeback, as Terry survived to make the Final Four. There were a healthy 16 entries in heat 3. Among the 'fresh' entrants were some heavy hitters: defending champ Marvin Birnbaum, Debbie Gutermuth, Ken Gutermuth, and Bruce Reiff, who between them, have won seven of the last 11 events. Champs fell like rain, however, as Debbie lost to Devin Flawd, Bruce to Chris Bauch, and Marvin to Roger Taylor (whose luck finally seemed to balance out). Ken, however, fared better with the top seed and led it to wins over Dave Denton and Sean McCulloch, until he ran into Jim Bell's Cincinnati '59 team, a defensive powerhouse. Meanwhile, Terry Coleman defeated Carrie Lewis in a close game with IU '81, while Peter Stein did the same to Harry Flawd with Louisville '83. Although contested in an early round, this game brought back memories of the first time these rivals had faced off, in the 1993 MMS Final. Fouls, key steals, three pointers galore, but nothing was sufficient to end the game in regulation. By the time the game was finished, with Peter avenging his earlier loss with a satisfying double-overtime victory, the game had drawn quite a crowd. It was easily the game of the tournament. Perhaps Pete's guys were tired after their previous-round epic, as his guys seemed to run out of gas versus Chris Bauch's very similar Louisville '80 team. In the regional Final, however, the 'doctors of dunk' came up short versus the stifling defense of Jim Bell's Cincy crew. Jim, who has won other sports titles, looked hungrily towards his first Madness plaque. While a group of 16 contested the last heat on Friday, the numbers were somewhat deceiving. Only two of these players had not played in a previous heat. The first, Andy Maly, beat Peter Stein, and Debbie Bell, before falling to Pete Staab in the semis. Jon Lockwood managed a win over Dave Denton before falling to Ken Gutermuth's 6th-seeded North Carolina team. Ken continued his steamroll run through the draw, beating not only Carrie, Jon and Bruce, but also Pete in the regional final. How would the former champ fare against the newcomer to the Final Four? As subsequent events would prove, Ken's offense was just as stymied as everyone else, and Jim seemed determined to show that players from the 50's could be competitive in today's game. Jim's opponent was in doubt for much of the game, but Jeremy managed to slow down Terry's high-flying Providence scorers just enough to win, placing Jeremy in his first-ever Final. In the Final, Jim's Cincinnati lads once again played tough defense. Jeremy, however, was content to grind it out as well, and his hard-working Kansas '71 team prevailed in a surprisingly low-scoring game. Congratulations to Jeremy on his first title, to Andy Lewis for his fabulous performance with the lowest seed, and to the other Final Four participants. In the end, however, my greatest thanks go to everyone involved in the tournament, for making March Madness the most fun event to run, each and every year. 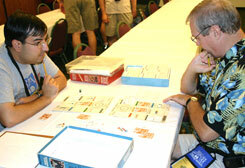 Bruce Monnin emerged victorious over a 32 player field in the third annual BPA March Madness PBeM Championship. 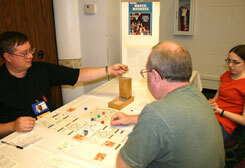 Bruce becomes the first player to win both the BPA's March Madness championship at the World Boardgaming Championships as well as the PBeM title. Bruce's 1975Louisvillesquad jumped out to a 13 point halftime lead and felt good with five quality offensive cards tucked in his hand. But the dice were not so obviously favorable in the second half, and Gene's 1956San Franciscosquad played tight defense and slowly bridged the gap, with the last play of the game being Bill Russell scoring 11 second half points, three points short of what was needed to force overtime. Thus, Bruce won the title by a 83-80 score. Larry Bird took advantage of his AA rating to average 31.3 points per game and become our tournament MVP while leading his team to the Eilite Eight. Final Four MVP is given to championLouisville1975's right forward Allen Murphy. With his C rating, he averaged 17.0 points a game in the Final Four and outscored his similarly rated adversaries in both games. Of the 62 games played in the tournament, over half were decided by a margin of victory of 9 points or less, with 17 games being decided by four points or less. The tournament will be renewed October 15th. Come join us in determining next year's champion of the BPA March Madness world.